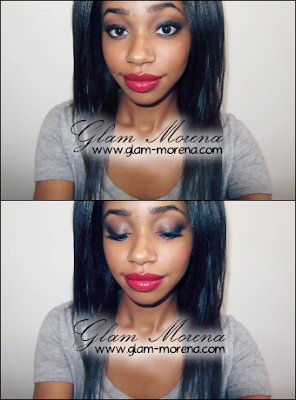 Glam Morena: Tutorial: Classic Beauty. During my last NYX Cosmetics haul I purchased a NYX Round Lipstick in Snow White. I've been on the hunt for a red lipstick that didn't have strong blue undertones and this one was perfect. I paired that lipstick with a classic smokey eye and VOILA! I like how u paired up the eye & lips. They work amazingly together. This is a great look on you, Im going for this look tomorrow, I have a wedding to attend with a pin up theme ;) Red Lips is what Ill be rockin!! Thanks for sharing!! Very beautiful with a side bun it would make for a perfect night out look!